Misc: Edgewater condos has many family amenities, such as controlled entrance, 24-hour security, 11,500 foot lagoon style swimming pool (plus several smaller swimming pools) landscaped with waterfalls, palms, exotic plants, flowers, whirlpools, golf, tennis courts, two restaurants on the water, jet-ski rental, para sailing, sailing, exercise room, convention center, gift shop, beauty salon, etc. 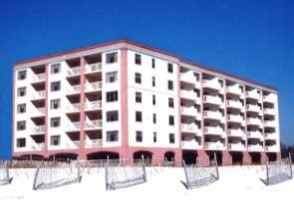 Edgewater condos has 110+ acres and over 1000′ of private Gulf-front. A coastal on the Florida Emerald Coast, Panama City Beach has sub-tropical weather; Panama City Beach lies in the southern sub-tropical area of U.S, where mild temperatures greet tourists year-round. Ocean breezes temper the generally hot summer weather, with warm spring/fall days and calm winds in the evenings. This area of the Gulf of Mexico has an annual average temperature of 75+/- degrees Fahrenheit and 340+/- days of sunshine each year, making for a popular outdoor lifestyle – tourists and locals alike enjoy the beautiful sugar-white beaches and abundant activities the area is known for.